With a greater understanding of MSDs and other workplace injuries amongst employers, moving heavy equipment is becoming a more difficult task to conduct safely and efficiently without implementing some form of ergonomic motorized equipment. One of our distributors ran into this problem when looking into ergonomic, motorized platform carts for a manufacturing client. The client in particular needed to be able to move very long and heavy pieces of steel, sometimes weighing up to 2 tons. The length of the pieces made solutions such as a forklift non-viable, and the weight ensured that without some kind of motorized solution, employee injuries were inevitable. So what motorized options can be easily maneuvered, and accommodate both exceptionally lengthy and heavy materials? The answer was a custom motorized platform cart. 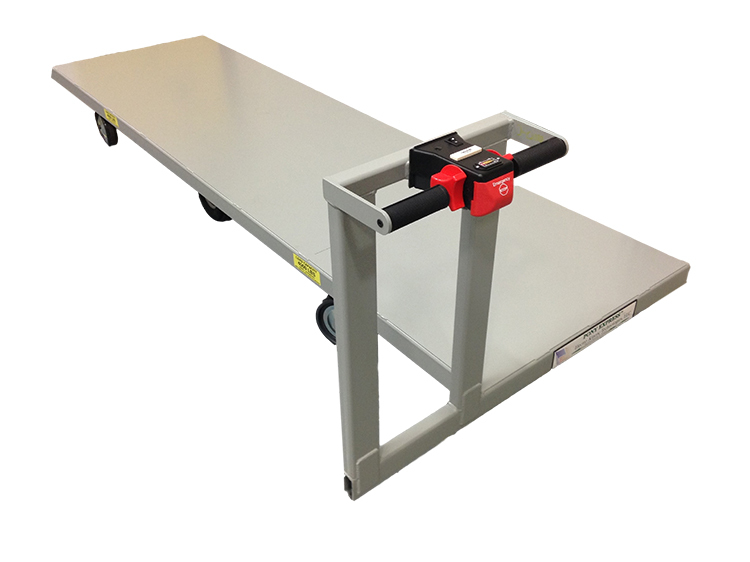 In the end, we were able to build a custom cart that met all of the above specifications. As a matter of fact, our engineers succeeded in creating a custom motorized platform cart so easily maneuverable, that we were able to operate it with one hand, despite a 4,000-pound load. Though we don’t recommend operating our carts with one hand, the video below shows just how much material handling ease and efficiency can improve with the right technology. Not every project requires a custom solution, but when unique needs demand more than what standard products can offer, Electro Kinetic Technologies excels at listening to the customer and finding innovative ways of meeting their needs. For technical questions regarding your material handling problem, head to our Ask An Engineer portal to speak directly to one of our engineers and get started on building the right solution for your application.